Is transit connecting people to jobs in America? To quote the study, “The typical metropolitan resident can reach about 30 percent of jobs in their metropolitan area via transit in 90 minutes.” Which, perhaps, helps explain why about 86 percent of Americans choose to drive to work and 75 percent drive alone, according to the Census Bureau. As the above chart shows, the Los Angeles metro area is slightly below that at 26 percent. Or, to put it another way, about one in four L.A. metro area jobs are reachable via transit within 90 minutes. In case you’re curious, that number is 37 percent in the New York metro area (check out other areas on this interactive feature). All this helps explain why Brookings is calling for increased investment in transit in America. Good luck with that: House Republicans this week called for cutting transportation spending. 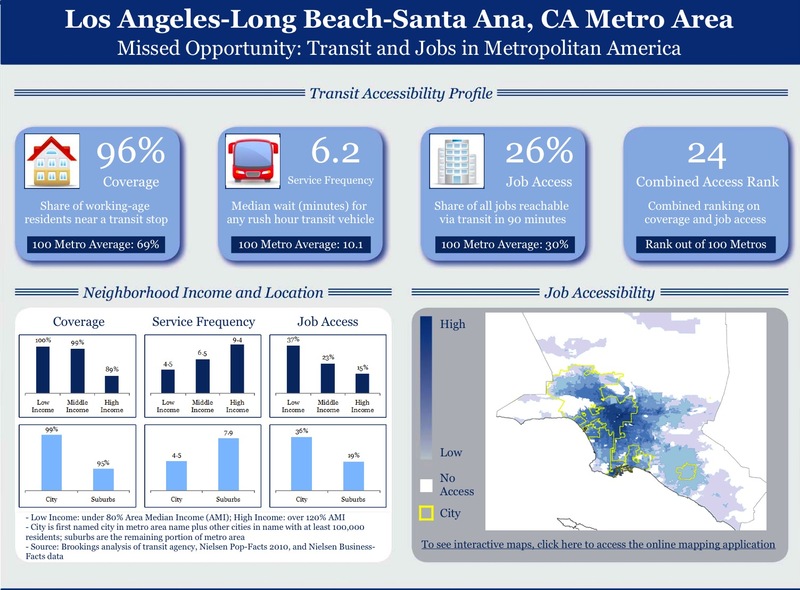 The study also shows that overall the L.A. area’s transit system has pretty good reach and frequency. I expect the 26 percent number here and elsewhere reflects the sprawling nature of America’s metro areas and how difficult it is to connect them. Of course, that was also the point behind the Measure R sales tax increase approved by voters in L.A. County in 2008 to build more transit. Once fully implemented, the transit part of Measure R should greatly increase the bus and rail network here and hopefully speed up travel times by reducing transfer times and putting more passengers on faster trains. 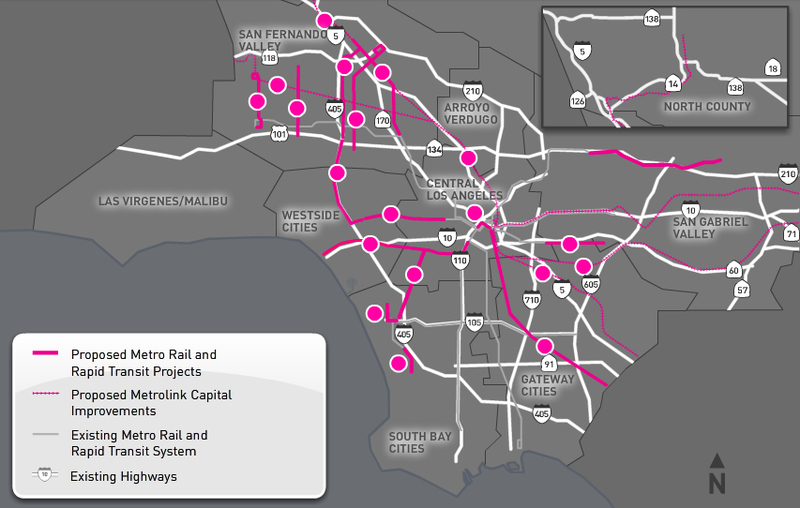 Among the projects that will serve big job centers: the Westside Subway Extension, the second phase of the Expo Line, the Foothill Extension of the Gold Line, the Crenshaw/LAX Line and the Orange Line Extension which will better connect the Chatsworth Metrolink station to Warner Center. The video below features Robert Puentes, one of the study’s authors. Don’t forget to account for the fact that many people CHOOSE to live far away from work. Transit is less effective at these distances. Heck, driving is not much more effective at these distances either. Is it a lack of transit access to jobs…or is the problem that jobs are moving to places where there are more car amenities (i.e. larger parking lots, garages, wider roads, suburbs, etc..) and not in urban areas where transit is more abundant?